The parallels between the Californian dune buggies of the sixties and the new ID. BUGGY are apparent. All beach buggies from back then featured a high degree of modular variability – based on the chassis of the legendary Beetle, with a four-cylinder boxer engine running at the rear. Small series manufacturers stretched a cover made of glass-fibre reinforced plastic (GFRP) over the chassis and engine of the Beetle, thus writing automotive history. The ID. BUGGY is tied to this cult concept with the technical possibilities of the modern age. The basis here is the progressive chassis of the MEB. Integrated in the vehicle floor: a high-voltage battery. This lithium ion rechargeable battery supplies the electricity for the ID. BUGGY’s 150 kW/204 PS electric drive motor in the rear. An additional electric motor in the front axle is also conceivable in order to realise an all- wheel drive with an “electric propshaft”. The clear design language expresses the unique experience when driving the buggy. To be able to feel the wind, a fixed roof and doors were deliberately dispensed with. This is why the resilient and minimalist design of the interior is characterised by waterproof materials. The concept car is a pure 2-seater; however, the ID. BUGGY can also be converted to a 2+2- seater. Volkswagen is opening up to external producers with the ID. BUGGY concept. The offer: You can build the new-era, zero-emissions dune buggy based on this concept. In general, the MEB also has the potential to become the new technical basis for e-mobility for many automobile manufacturers. Background: At the beginning of 2019, Volkswagen announced for the first time that it intended to also make the MEB accessible to competitors as an electric vehicle platform. At the same time, the ID. BUGGY illustrates the broad spectrum of emission-free mobility that can be achieved with the modular electric drive matrix within the Volkswagen brand: Following on from the ID.1) (compact class), ID. BUZZ1) (van), ID. CROZZ1) (SUV) and ID. VIZZION1) (saloon), the new ID. 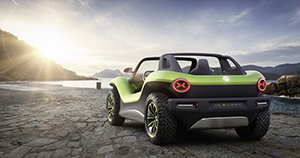 BUGGY is the fifth concept car based on the MEB, with which Volkswagen has used to confirm the multifaceted nature of the ID. Family.